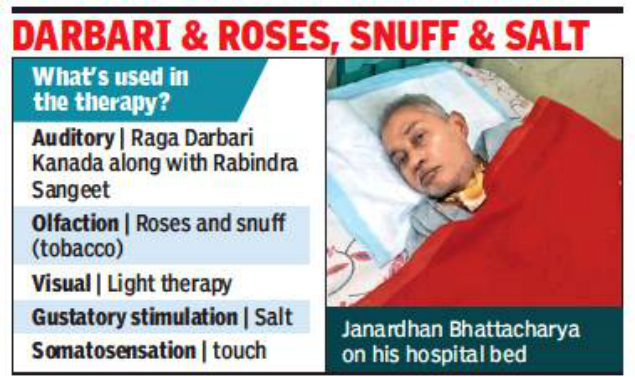 Doctors at SSKM Hospital applied an intense multi-sensory stimulation therapy to wake up a 64-year old Agartala resident from coma. This therapy was used to stimulate his five sensory organs. The patient, Janardhan Bhattacharya, now breathes on his own, responds to commands, sees, feels and even moves his fingers. Doctors are hopeful that he would soon get back his speech. The retired Agartala government employee was airlifted to Kolkata on October 19 after he suffered haemorrhagic stroke at home. At first, he was admitted to a private hospital, where he slipped into coma on the first day. Later , he was taken to Dum Dum Municipality hospital and on December 18, shifted to SSKM. “Since medication was not helping the patient, we decided to go for the unconventional therapy,” said Rajesh Pramanik, under whose care the patient is admitted at the physical medicine department. Things, even people have a way of leaking into each other like flavours when you cook.